Beer is most likely your answer to football games. But, if you’re watching a game with me, I’m drinking wine. And I’m going to try to convince you it’s the best choice for game day. One of my favorite game day foods is wings. You think ice cold beer is the best option to wash them down. That’s because you haven’t found just the right wine. This is my go-to wing recipe. They’re baked. Which is much easier than frying, but just as delicious. Serve the Ginger Soy Wings with a bottle of bubbles and the Buffalo Wings with a fruity zinfandel. 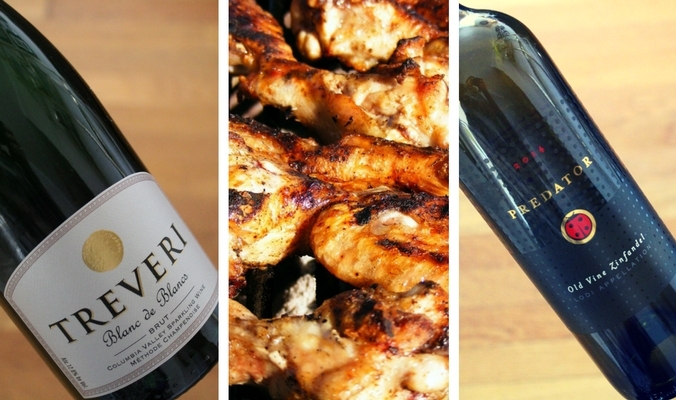 With the Ginger Soy Wings, we drank the Treveri Cellars Blanc de Blancs Brut, a méthode champenoise sparkling from Washington state’s Yakima Valley. These wings are sticky and sweet. A brut sparkling wine is perfect for pairing with the sugar. Bubbles are crisp and refreshing and a drier sparkling offsets the sweetness. The pear and apple flavors were great with the ginger and Asian flavors of these wings. And the bubbles cut through the stickiness to wash them down easily. With the Buffalo Wings, drink zinfandel. You do not want a big, tannic red, like a Cabernet Sauvignon. Those will do nothing to cool spicy foods. Zinfandel is lower in alcohol and less tannic, so it works with the spiciness. This combo was like a peanut butter and jelly sandwich with barbecue chips, a staple in my household growing up. Trust me on this one. The fruity and tangy, spice work together. You’ll get sweet and fruity on the front end and, then, tangy BBQ shocks your senses and gives you some real grit. Just like this zinfandel/buffalo wing combo. We drank the 2014 Predator Old Vine Zinfandel. It’s fruity, youthful and juicy. Serve it slightly chilled to further cool the spiciness of the wings. Watching Sunday football is supposed to be relaxing, low-key and a little indulgent. Choose approachable, inexpensive bottles to drink with easy, informal game day foods. 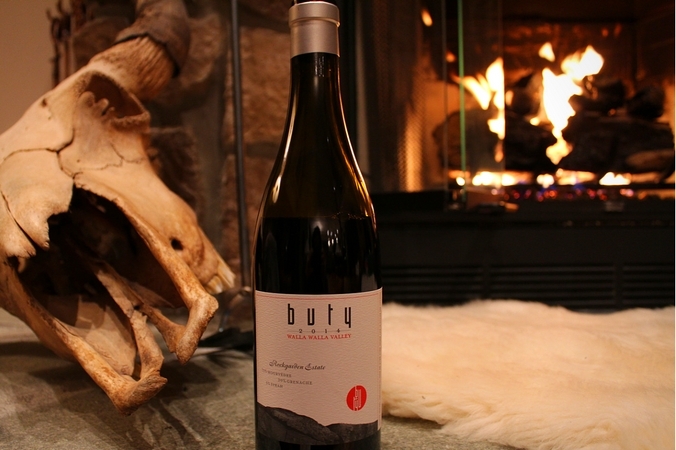 Keep the wines casual, food-friendly, and slightly chilled and you’ll find yourself guzzling wine all through the game. Cola and Wine. It’s a Thing. According to my Instagram feed, this was the summer of Frosé. Everywhere I looked this pink, slushy wine cocktail was being slurped. And although delicious, one of the perks of being a wine drinker is no measuring, no mixing, no blending. 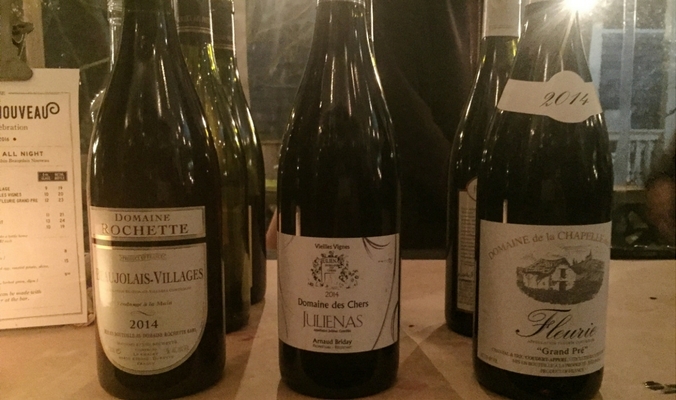 Find a bottle, open, pour, drink. It’s a simple process and one I value immensely. But, there is a novelty to a summer cocktail and you shouldn’t miss out on its pleasures. Enter the Kalimotxo. (Pronounced cal-ee-mo-cho). This wine cocktail requires pouring half a glass of wine and filling the other half with cola. And if you want a little added brightness (and you’re not exhausted from the above steps) add a squeeze of lime. Voilà. Complete. Your late summer cocktail. The Kalimotxo is popular in the Basque region of Spain and tastes similar to sangria (with less fruit chopping) or cherry cola (with alcohol). Use a dry, tannic Spanish Rioja for the mixture. Tempranillo and Garnacha are the grapes traditionally found in these wines. 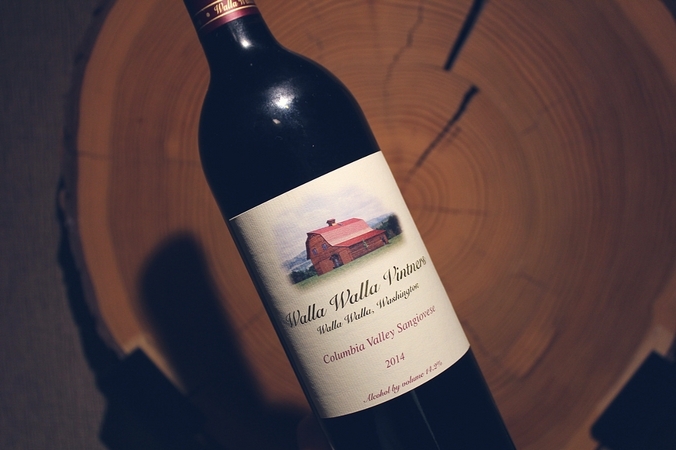 Because you’re adding a sweet cola, you’ll want a structured wine with strong tannins. Also, because this is a wine cocktail, use a cheaper red wine. Don’t waste a pricey bottle on something you’ll be mixing and covering up some of the flavors. I chose the Albero Tempranillo. 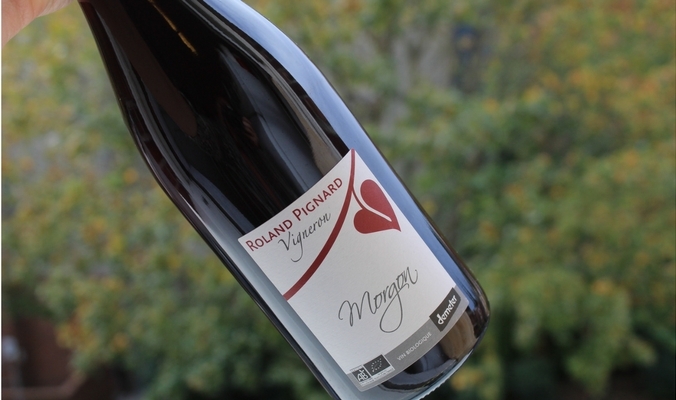 It’s dry and lighter-bodied, with lots of cherry flavor and spice. And six bucks. 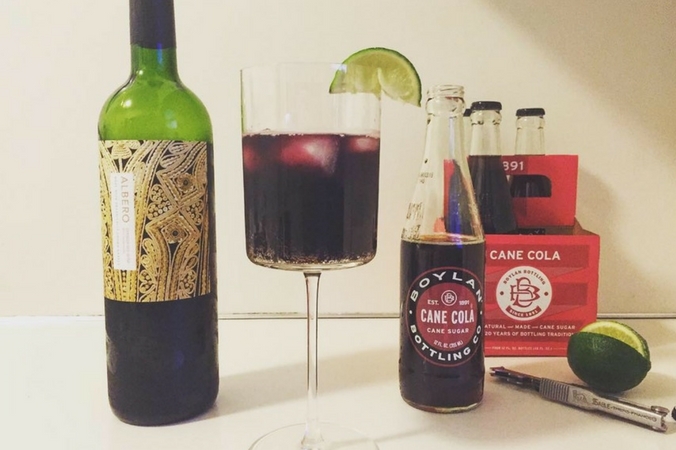 For your cola, choose something made with real cane sugar, like Boylan’s Cane Cola. They are less sweet than colas made with artificial sweeteners. That is unless, you want a super sweet red wine cocktail. Follow the directions below closely and enjoy. Salud! 1 Comment Cola and Wine. It’s a Thing. Down The River We Go! 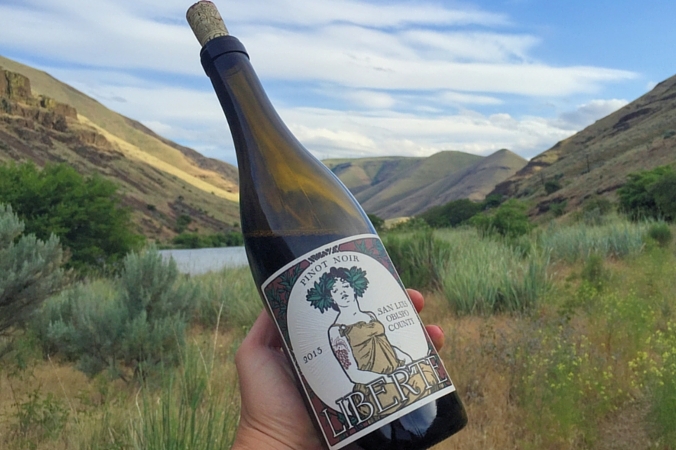 River rafting trips mean being ultra selective about the wine brought along. Everything you bring has to be easily packed onto your raft. And you must be prepared to lose it all. If your boat flips, if a rapid washes everything in your boat away, if you lose your footing while chugging from the bottle, you can bet that bottle is sunk. And swimming upstream and to the bottom of the river is not an option. Are you on the edge of your seat yet? Essentially, our weekend trip river rafting was One. Wild. Ride. Honestly, it was more of a joy ride, except for some extreme paddling when the wind was doing everything it could to divert our path. Which I kid you not, was some of the most resistance I have ever felt in my life (other than that time I tried to get my boyfriend to duet “Time of My Life” at karaoke with me). The Deschutes River is not exactly the wildest river, although I did tell some people at work that we would see Class VI rapids. To be fair, I didn’t really have any idea what I was talking about, but I’m sure I sounded like an experienced river rafter. We spent two three days and two nights on the river. Rafting by day, camping by night. And packing everything in and out with us. The selection of wine was limited and because of previously stated potential wine casualties, I brought inexpensive Trader Joe’s selections that would be refreshing during or after a day in the sun. 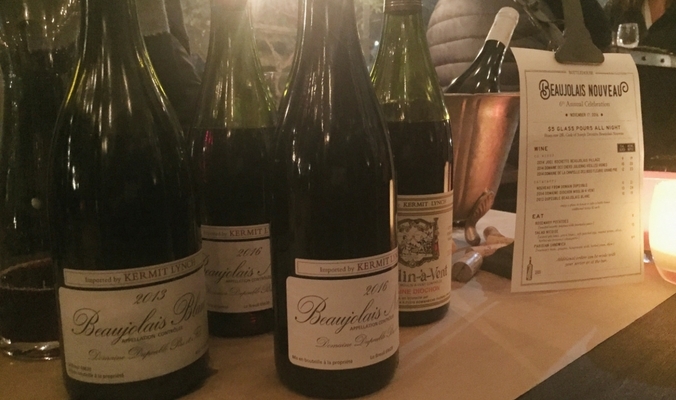 I brought along the 2013 Liberté Pinot Noir, first, because it’s from San Luis Obispo County, and many people on the trip went to school there. I was so excited to share the fun fact that this wine was from the city of their Alma mater. They weren’t as excited. At $10, I was pleasantly surprise. It was tart, kind of smoky and acidic. Fulfilling black cherry and smooth enough to gulp when I needed something to quench my thirst after a long day in the sun. 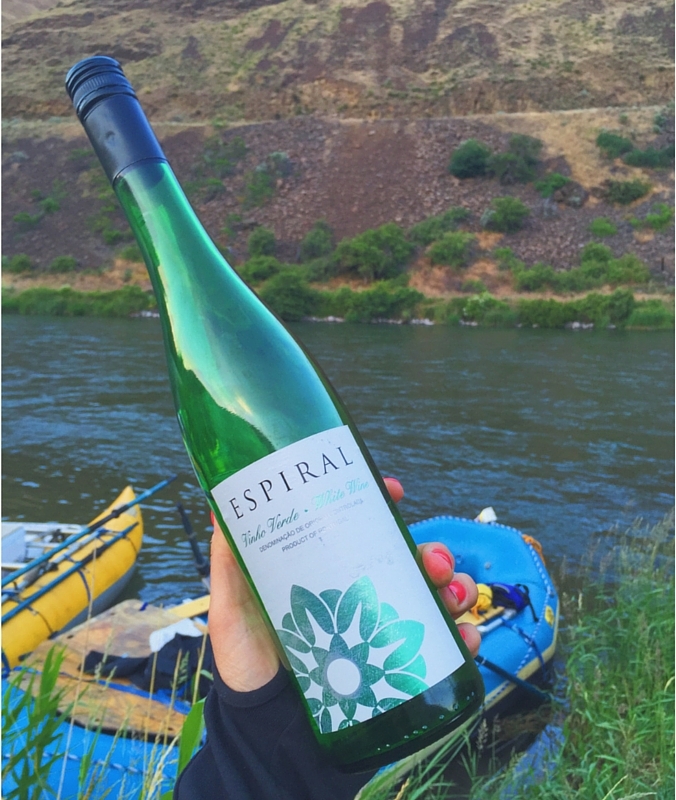 I picked up the Espiral Vinho Verde, because choosing Vinho Verde when it’s going to be hot is like choosing Cadbury Eggs when you know it’s going to be Easter. (Read: an easy choice). The slight effervescence says party, but not like the fuller bubbles of Champagne scream celebrate. It’s lively, mineral and dry. These wines and I now have special bond. They made it through my inaugural rafting trip and helped me survive the very rustic camping conditions. Leave a comment Down The River We Go!